Calling a film Flawless is certainly asking for it to live up to a lot. I think it was Glenn Kenny, of Premiere, that recently brought this up in regards to another film with a similar name. He was implying that critics sharpen their knives when confronted with a name like that. And a recent survey of some of the titles of the reviews for this bank heist movie confirms Mr. Kenny's theory. Of course, if you're Michael Radford (Il Postino ), the director, wouldn't you do your best to avoid any such attacks by excising any potential pitfalls from your film? The film follows Laura Quinn (Demi Moore), an American Oxford grad, who has hit the relatively low glass ceiling within the London Diamond Corporation. See, this is 1960s London, and being a woman, she is unlikely to move up any further. Mr. Hobbs (Michael Caine), the night janitor, has quietly observed her frustrations mount as she gets passed up for promotion after promotion. Seeing her work late into the night, obviously going home to a single life, he targets her for a surprising proposal. He approaches her with an opportunity to get revenge by stealing just a few of the diamonds that, together, they have access to. Suffice to say, that there is more to his plan than even Quinn is aware of, with things escalating greatly from there. Demi Moore is not entirely convincing as Quinn. She is believable enough as a driven executive. Heck, ambition is a quality that distinguishes Moore in real life. But I don't buy her as an Oxford graduate. It seems like an unnecessary contrivance to explain why an American would be working in this British boys' club. I suspect that making Quinn British would have been a hard sell also. Moore's accent comes and goes frequently in the film. Lastly, Moore does not carry "matronly" off very well. It is hard to believe that this stunning woman would live out her life alone given the era she lives in. There is a throwaway scene that implies she gets hit on all the time, but again it seems contrived to reinforce the flimsy notion that this lady has gotten to where she is through sheer perseverance. The part is better suited to an actress such as Charlotte Rampling or Glenn Close, someone who's glamour may have faded just a little bit more. Michael Caine is great, playing the part for what it is, a typical old everyman except for the few cards he's still got left up his sleeve. He expends minimum effort in creating the role, even reverting to his natural Cockney accent to play Hobbs. You're even convinced he could come up with the plan for the heist all by himself. But the movie pretends to have one up on you by not fully revealing the execution of the plan until its finale. And then you realize... that's it? That's how this old man, and proper 1960-era lady, pulled off the heist under every one's noses unaided? How fortuitous that the Finch (Lambert Wilson), the insurance investigator, has a soft spot for Laura. What a coincidence that there is political turmoil surrounding South African diamonds at the time of the heist, and that some of the missing diamonds are of South African origin. Does it give the movie some social relevance? Well no it doesn't. There is a lot of "smoke and mirrors" in the plot that could have added some measure of complexity, but ultimately don't lead us anywhere interesting. And the framing device used to tell the story, an aged Laura Quinn telling a modern-day reporter of her part in the little-known heist? It only seems to serve the purpose of making Quinn's character sympathetic, which doesn't feel necessary. Additionally, it unintentionally sets up a false notion that the story being told is based on real events. It is absolute fiction. 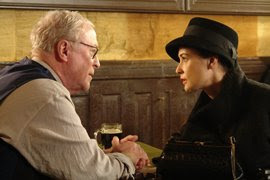 The biggest mistake contributed by this modern-day sequence is its depiction of Quinn as Demi Moore in some rather bad old-age makeup. It is distracting and completely takes you out of the film's reality only minutes into its start. It might have been better to save Moore's appearance for a reveal at the end of the film. I can't say that the film was not mildly entertaining. The period setting is an attractive feature of the movie. And Radford keeps the pace of the film exciting enough to provide for a diverting afternoon matinee. But a few blunders here and there contribute to making the film far from flawless. Still provided courtesy of Magnolia Pictures.